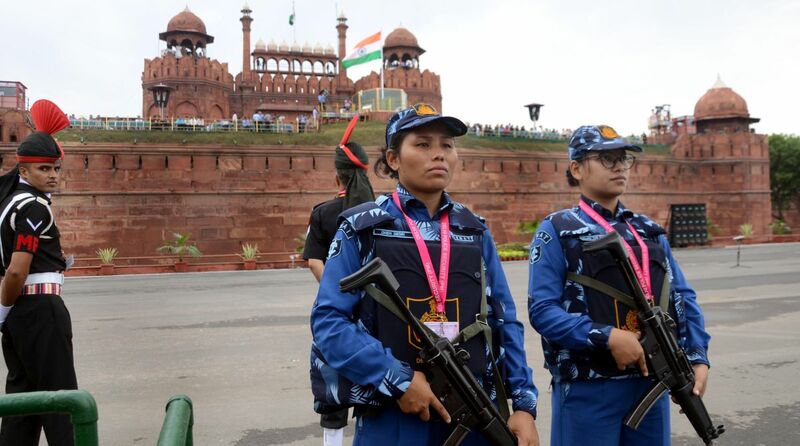 In the view of Independence Day, security has been beefed up across the national capital, especially the area near the Red Fort and Indira Gandhi International Airport. To prevent any untoward incidents on the I-Day, several restrictions have been imposed when it comes to movement of traffic. Security has also been escalated in neighbouring cities like Noida, Ghaziabad and Gurgaon. Police have placed barricades at many places to keep a tab on traffic. Delhi Police have already placed barricades and deployed its personnel at important locations in Delhi. According to an advisory of Delhi Police, more than five roads will remain closed and traffic will be diverted on some routes as part of security measures. The roads which will be closed for the public from 5 am to 9 am on 15th August are – Netaji Subhash Marg, Lothian Road, S P Mukherjee Marg, Chandni Chowk Road, Nishad Raj Marg and Esplanade Road. Vehicles without the parking labels for the rehearsal parade may face difficulty in moving on Mathura Road, Bahadur Shah Zafar Marg, Tilak Marg, Subhash Marg, Jawaharlal Nehru Marg and Ring Road between Nizamuddin Bridge and ISBT bridge on 14 August. On Sunday, Delhi Metro Rail Corporation (DMRC) had announced that parking facilities will not be available at the Delhi Metro stations from 6 am on August 14 till 2 pm on August 15 due to security concern. People have been advised to take alternative routes available to avoid any inconvenience. “Parking facilities will not be available at Delhi Metro stations from 6 am on August 14 (Tuesday) till 2 pm on August 15 (Wednesday), in view of the security measures adopted on the occasion of Independence Day,” the Delhi Metro Rail Corporation (DMRC) had said in a statement. Metro services between Indraprastha and Mandi House will remain the usual, except for the time when Prime Minister’s procession passes through Tilak Marg. Keeping security concerns in mind, some gates of metro stations at Delhi Gate, Lal Quila, Jama Masjid, and ITO will remain closed, according to DMRC. Delhi Metro will keep the entries and exits closed on its Heritage Line network (ITO – Kashmere Gate) on Independence Day. The train movement between Delhi Junction and Shahadra railway station will remain temporarily suspended for one hour and 45 minutes — from 6.45 am to 8.30 am. Trains will be cancelled, diverted, regulated and rescheduled on 15 August 2018, according to Northern Railway authorities. The trains that have been cancelled on 15 August, 2018 are 64437 Ghaziabad-Delhi Jn EMU and 64402 Delhi Jn-Ghaziabad EMU. The movement of goods vehicles between Nizamuddin bridge and Wazirabad bridge from 12 midnight of August 14 to 11 am on August 15 will not be allowed. DTC buses will not move on the Ring Road from 4 am to 11 am on August 15. These buses will run on alternate routes to complete their run.